It’s been four years since the world of horology first captivated me, but I cemented my amour with it barely a year ago. The reason for the declaration of lasting love? In a nutshell, Baselworld 2017! The world’s largest watch and jewellery fair is held every year in Basel, Switzerland — it brings together brands, experts, journalists and aficionados for a week-long display of luxury, craftsmanship and novel ideas. What initially wowed me was the sheer magnitude of people, followed by the breathtaking amount of bling and, finally, the mechanical watches. I sidestepped the entire jewellery section to make a beeline for the Patek Philippe booth which, despite being one of the more understated ones, was buzzing with an aura of importance and excitement. 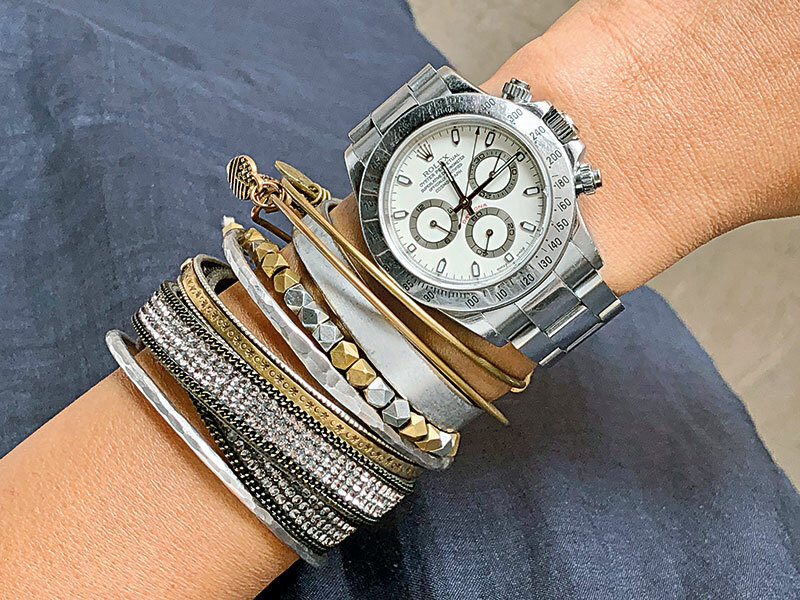 I left half an hour later, unsurprisingly awestruck, and moved to Rolex, Omega and Breguet before taking a much-needed breather — when I noticed a pattern in my behaviour. Unconsciously yet instinctively, I had evaded the ‘ladies’ section of every booth and gone straight for the men’s watches, spending hours learning about their journeys from conceptualisation to final product and observing the highly complicated movements. That’s not to say the offerings for women were subpar — it’s simply an unfortunate fact that there aren’t as many mechanically complex models available to us as there are in the men’s categories…which is something I have yet to comprehend. I did, of course, spend the rest of my days there visiting booth after booth, marvelling impartially at each masterpiece including the more feminine ones from Chanel, Harry Winston, Bulgari, de Grisogono and the likes. I minutely inspected Graff’s elaborate Princess Butterfly Secret watch and gawked at Chopard’s For You watch, but even while I respected the skillfulness involved in the gem-setting processes, I knew that these tickers just weren’t for me. Then, I saw the Jaquet Droz Loving Butterfly Automaton. I had already been fascinated by métiers d’art, but this was the first time that it was right in front of me. Nothing can describe the feeling of watching an artist work on an inexplicably tricky piece by hand, unbothered by the fact that you’re hovering right above their magnifying glass. Seeing the moving parts — the spinning wheels, the grinding gears…it was like listening to the matchless harmony of a first-rate choir. Ever since, I’ve found myself oscillating between vintage or heritage-inspired masculine models, and more delicate ones that feature engraving, grand feu enamelling, embroidery or other lesser-known crafts. Where the former style reminds me of the timepieces that my debonair grandfather left behind, the latter provokes a vision of what I may some day pass on to my own offspring. But what I might find terribly difficult to part with is an MB&F, if I ever do end up owning one. I didn’t ever expect to love anything so absolutely ‘out there’ before I saw the genius watchmaker’s collection of unusual watches — especially the Octopod. I have my eye on that magnum opus, and I hope to one day have it sitting on its very own table on my side of the bed. And regardless of how much horology advances by then, whosoever inherits the clock will love it for its individuality in the same way that they loved me for mine. So, my future grandchildren, don’t expect diamonds; expect the unexpected. And if you choose to cherish my acquisitions but chase sparkly jewels of your own — so be it! Because it’s important to remember that these magnificent, compact creations don’t come with any kind of reservations; not on my watch. In my opinion, gender-based categories shouldn’t even exist anymore by the time you read this. You can be a lady with a sturdy instrument on your wrist, and you can be a man who loves precious stones on a bezel. You can admire the meticulous brushstrokes that have been swept onto a dial by someone who may not even be alive anymore, and you can take interest in mindboggling contraptions that do so much more than just tell the time. Above it all, watchmaking is an art…and art, my dear, is universal.